Google’s Street View technology does more than capture mundane shots of city streets. As the platform has evolved, Google has offered striking images from exotic places like the Galápagos Islands, Mount Fuji and the Eiffel Tower. You can even take a look inside CERN’s Large Hadron Collider. But Street View has also revealed unintentional surprises, from murder and mayhem to people’s most embarrassing moments, and it has the potential to capture terrifying images, too. 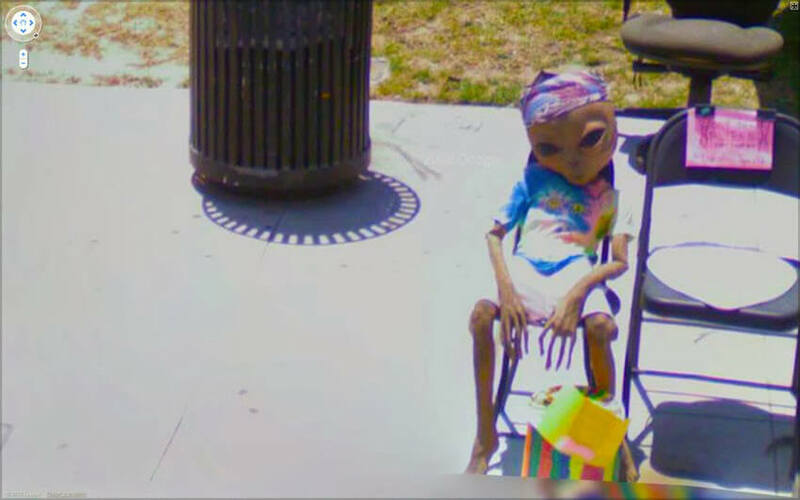 With Halloween approaching, we’ve rounded up 20 of the scariest images Street View has to offer — plus an excellent bonus image to calm you down once we’ve scared your pants off. The truth isn’t out there — it’s right in front of us! Okay, so this creepy alien is probably just a doll. But doesn’t it look a little too lifelike? An anonymous user on a paranormal message board insists this is an image of an angel returning to heaven. We’re thinking it’s probably just a glitch on Google Maps, but who knows? This image of a dumpster full of discarded mannequins was captured in Chile. We’re thinking they look an awful lot like mummified corpses. — Déjà vu is a glitch in the Matrix. It happens when they change something.— They cut the hardline, it’s a trap! Get out! We wouldn’t dare approach the cars trapped under this massive flock of seagulls.Run. Run so far away. This van on fire makes for a beautiful picture, but we wouldn’t want to be the van’s owner — or the stunned shirtless man to the right. Reddit user nafaaan shared this image of the ruins of Hashima, a Japanese island that has been uninhabited for nearly 40 years. Once a mining town with more than 5,000 residents, Hashima was abandoned in the 1970s and is now deemed unsafe for tourists to visit — even though it’s the site of Javier Bardem’s lair in Skyfall. Sh’yeah, you’ve made it through our gallery of extremely extreme horrors. Party time! Excellent!